It is important to note that Malbec, a varietal that has its origins in Bordeaux and is primarily used sparingly in blending those wines, is not a grape that generally offers enough complexity to stand on its own. What continues to make wine so fascinating to me is the role that climate and soil play; what works in one region may not work as well in another, and conversely, just because a grape doesn’t grow well in one region of the world, that doesn’t mean it can’t be successful elsewhere. None of this is immediately intuitive, and the ultimate answers regarding which grapes will be successful where only become apparent after years of experimentation, trial and error. In Argentina, they have been able to craft the cultivation of Malbec as a stand-alone grape in a manner that bears no rival anywhere on the planet. As opposed to Bordeaux, where it is grown to add to balance to the more tannic, powerful and elegant varietals of Cabernet Sauvignon and Merlot, in Argentina, the grape is allowed to soak up its unique terroir and express itself in an unparalleled fashion. Regions such as Mendoza and the Uco Valley offer almost constant sunlight at high elevations over a mountainous landscape and clay soils, resulting in an expression of Malbec that is rich and ripe, boasting complex undertones of mocha and smoke that is inherent to the soil, and almost always finishing with a blast of easily identifiable chalky mineral. Additionally, the since nature of the grape doesn’t usually necessitate much time in the celler, these big, powerful red wines are ready to drink on the date of bottling. One winery that is a sure bet perennially is Bodega Catena Zapata, whose entry level Malbec is affordable and widely available. Their 2009 effort may be their best yet. Bodegas Catena Zapata Malbec Mendoza 2009, 91 Points, $20, 75,000 Cases Imported- There’s lots of wet mineral on the nose here along with ripe red fruit, mocha and cedar aromas. This is very ripe with a savory herbal edge and a velvety texture of rich plum, fig and fruitcake that leads into undertones of mocha bean and smoke, finishing with a chalky bite but lingering long. Gets extra points for a mesquite-type of smoke flavor that adds intrigue and merits attention. 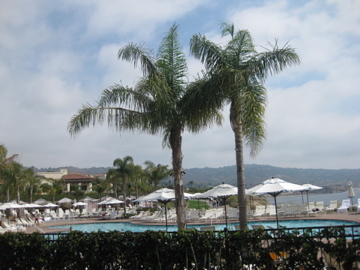 I recently returned from a week long excursion to California’s Central Coast, where after spending some time tucked away at the secluded, highly underrated Terranea Resort in Rancho Palos Verdes (below), I concentrated my efforts on seeking out wines in the Santa Barbara and Paso Robles wine countries. As well as discovering fantastic new wines, my wife and I were also impressed by the hilly scenery of the terrain encompassing these wine regions, and also made a point to enjoy the delicious local cuisine. The vineyards around Santa Barbara excel at producing Pinot Noir, Chardonnay and Syrah, while further north in Paso Robles, vintners have begun to perfect the production and blending of Rhone grapes like Grenache, Syrah and Mourvedre (GSM). While staying at the spectacularly landscaped Four Seasons Biltmore in Santa Barbara, which also boasts an unparalleled view from right on the edge of the Pacific Ocean, we made the short drive across town to visit Jaffurs Winery. 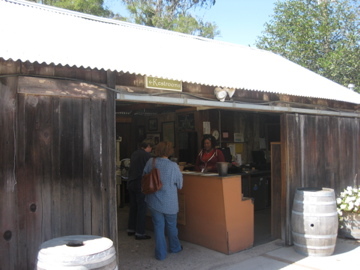 The Jaffurs production facility and tasting room is housed in somewhat of a neighborhood setting at 819 E. Montecito Street, where the grapes are transported from the various vineyard sources and fermented there before being bottled. Since we were arriving on a Thursday, and outside of the winery’s normal tasting room hours (11-4, Friday-Sunday), I had called ahead to schedule an appointment, which they were more than happy to accommodate. We walked in on the workers fully engaged in the harvest and de-stemming grapes in the driveway outside of the facility, and after inadvertently asking owner Craig Jaffurs to point us to the right path, we directed ourselves into the back of the building. In this barrel room/ tasting room/ fermenting garage hybrid, we enjoyed as authentic a tasting experience as you can expect. Founding partner Dave Yates came to greet us, and as we were about fifteen minutes early and it was clear that he had not yet wrapped up his work for the day, he asked me if I could lend a hand as he prepared to cover a vat of freshly picked Pinot Noir grapes. I even assisted with the addition of some carbon dioxide to the covered grapes, although nearly caused an explosion on my first attempt. 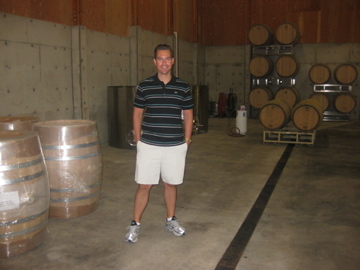 It was quite unorthodox to be sure, but at least I can say that I played a small part in creating the 2011 Pinot Noir! We sipped on fresh, fruit forward and floral whites like the Jaffurs Viognier 2009 (88 Points) as the workers came into the tasting room, set up a table and dove into a late lunch with a vast array of Bordeaux and local Syrah in tow. Although we felt like we were intruding a bit, the workers could not have been friendlier, inviting us to join them and even setting up another table for us. At this point, we were left on our own to taste the final three bottles of our tasting. It became a bit impersonal as the workers carried on about their own business and conversations, and left us on our own to taste the Jaffurs Pinot Noir Mistress 2009 (89 Points), the Jaffurs Syrah 2009 (90 Points), and the Jaffurs Grenache 2009 (90 Points). After taking some pictures by the barrels, I mentioned how much I enjoyed their Syrah and how much I tend to enjoy that varietal in general, and Mr. Yates was more than happy to offer to open up a bottle of the single vineyard Jaffurs Syrah Verna’s Vineyard 2009 (94 Points) for us to sample at our leisure. Showing seamless black plum, blackberry and licorice flavors above layers of earthy leather, tar, mocha bean and intense black pepper spice, this turned out to be a huge highlight of our visit, especially as this bottle is not even available for regular purchase but reserved only for wine club members. I picked up a bottle of the Viognier for our seafood buffet dinner at Bella Vista restaurant at our hotel (Thursdays 6-10, $59 per person, free corkage, below), and while I was surprised we were still charged for two $10 tasting fees, I could hardly complain after the amount of their well-crafted wine we were allowed to consume. We got to keep the glass as well. 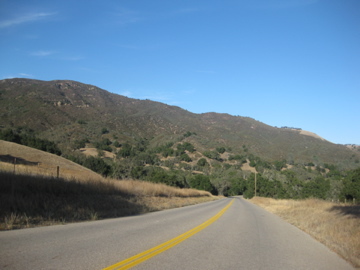 The next day we made our way across the somewhat intimidating but incredibly scenic hills of San Marcos Pass road in route to our tasting stops at Zaca Mesa and Foxen north of Los Olivos. 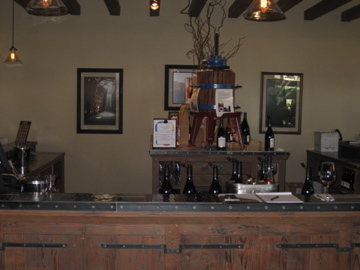 At Zaca Mesa Winery, we enjoyed about ten tastings of their various Rhone varietals. The Zaca Mesa Z Blanc 2009 (88 points), a white blend of Grenache Blanc and Roussane, was well-balanced and refreshing, showing citrusy apricot and pear loaded with floral spices. However, I was more taken by their red wines. After gaining high acclaim for the 2006 vintage of the Zaca Mesa Syrah and disappointing a bit on the follow up to that effort, the 2008 (89 Points) found itself squarely in between, with juicy, ripe plum and berry fruit above layers of exotic lavender spice, chocolate and soft minerality. More impressive were the Zaca Mesa Z Three 2008 (91 Points), a GSM blend with deep, perfumey black currant flavors that gain complex notes of leathery earth, cracked black pepper and smoke, and the Zaca Mesa Syrah Reserve 2007 (93 Points), an elegant and polished combination of juicy black fruit and smoked meat, leather, mocha bean and pepper. I bought a bottle of the latter to enjoy by the fire that evening, and our $10 tasting fees were happily waived by our friendly server Angela. The drive up Foxen Canyon Road to our next stop was one of several roads over the course of our trip that to my surprise stuck out to me from a natural beauty standpoint, and it is one that remains solidly engrained in my memory, the same way that Dry Creek Road north of Healdsburg or the Silverado Trail in Napa Valley are. We made a stop at the famous “Shack” at Foxen Winery, where they pour Bordeaux varietals from that producer’s 7200 label (below). While agreeable enough, none of these offerings jumped out at me, but I was more interested in tasting their Burgundian wines, which they pour at a separate, newer tasting room just a quarter mile down the road. For $12, you can enjoy three tastes at each location as well as very friendly conversation, and while I enjoyed the wines more at the newer location, I preferred the rustic ambiance and energy of the tasting experience at The Shack, and firmly recommend making both stops. The Foxen Pinot Noir Santa Maria Valley 2009 (89 Points) is always reliable, and this time around delivers ripe raspberry and watermelon fruit along side of floral rose water and white pepper spice notes. Better yet was the exciting Foxen Pinot Noir John Sebastiano Vineyard (91 Points), which shows a solid core of perfumey violet, plum and blueberry above a strong note of campfire smoke and undertones of allspice. We headed back into the quaint, quiet town of Los Olivos to hit some tasting rooms there and to check out the lunch scene at Los Olivos Cafe (this is the restaurant from the movie Sideways in the famous scene where Miles insists to Jack that he will not be drinking Merlot with his meal.) 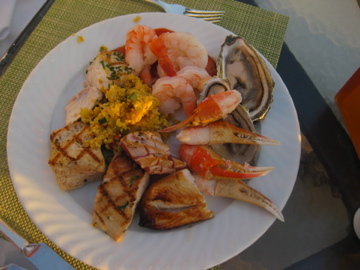 The restaurant offers a wide and diverse list of area wines as well as flavorful cuisine sourced from fresh local ingredients. We dined outside and I enjoyed my second of four consecutive pulled pork sandwich lunches. I was surprised to learn that the town doesn’t have a gas station and has been having trouble with its running water. It takes the term wine “country” to a new level, at least for me. Byron Winery recently opened up a clean and spacious tasting room a short walk from the Cafe, and offers a tasting of five wines for $10. This is well worth a stop, as these intricate wines can be hard to get ahold of, especially since the vineyard itself is not open to the public. Byron is famous for its Chardonnay, and both the Byron Chardonnay Santa Maria Valley 2009 (88 Points) and Byron Chardonnay Wente Clones 2007 (88 Points) showed rich golden apple and pear citrus above well-intertwined butterscotch and vanilla bean from the oak. The Pinot Noir showed expression and elegance, especially the Byron Pinot Noir Nielsen Vineyard 2009 (91 Points), which boasts an incredible mouthfeel of floral, juicy plum, blueberry and blackberry fruit that leads into complex smoke and clove spice notes. Also worthy of mention was the Byron Pinot Noir Santa Maria Valley 2009 (90 Points) with its elegant, spicy body of cherry, plum and wild raspberry flavors that pick up cinnamon and cardamom spice notes. 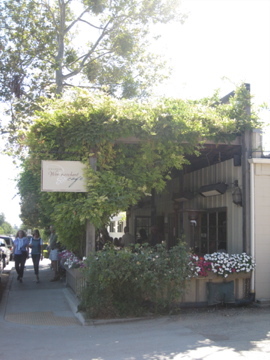 Across the way is the smaller tasting room shared by Tensley Cellars and Carina Cellars, both produced by winemaker Joey Tensley. For an incredibly reasonable $5 fee, we sampled five generous tastes from Tensley and three from Carina, all of which showed excellent structure and balance. Tensley, long sold out of their 2008 vintage and recently sold out of their 2009, had plenty of young 2010s to sample, but none of them seemed overripe or dominated by tannic dryness. The Tensley Syrah Colson Canyon 2010 (92 Points) was the big draw, layered with roasted meat and smoke notes that lead into dark plum and blackberry fruit enveloped by a streak of pepper spice. Their entry level edition of this varietal, the Tensley Syrah 2010 (90 Points) was nothing to scoff at either, with its bright red currant and raspberry fruit that evolves into chocolate, smoked meat, black pepper and graphite. At Carina, a GSM blend labeled Carina Clairvoyant 2009 (91 Points) showed balanced flavors of bacon-wrapped dates, rich black currants and spice. On our way to the incredibly charming Hotel Cheval in downtown Paso Robles, we stopped off at the Hitching Post in Buellton, also of Sideways fame. You can still smell the famous rub cooking early in the afternoon from the parking lot, and if you wander into the always popular bar area after 4 pm on the weekend, you’d better be prepared to stand (below). We both had the sauce-less pork ribs and I opted for the tasting of 7 wines for a $9 fee at the bar. Sadly, the quality of the Hitching Post wines has taken a step down recently, as I didn’t find a single wine that earned a score above 87, and most scored less. That won’t keep me from coming back to this great locals hangout to eat the next time I’m in town, however. We met up with some friends in Paso Robles for a full day of tasting the following day, starting off at Caliza Winery just off of Highway 46. Their Caliza Pink 2010 (87 Points) was our favorite Rose of the day and made from a blend of GSM and Primitivo, but things began to really take flight with the reds, especially the Caliza Syrah 2008 (92 points), which dances on the palate with silky plum, cherry and licorice notes that are structured and elegant above its smoke, mocha and peppery spice notes. Also quite impressive was their GSM blend, the Caliza Azimuth 2008 (90 Points), and its toasty body of espresso and briary herb notes that combines with juicy black currants. Our tastings were waived with purchase, but ordinarily run a very fair $10. After stumbling across an incredible bottle of Booker Syrah Fracture 2008 (96 Points) the night before at the Pony Club bar at our Hotel Cheval, I decided to call an audible and make a quick stop next door at Booker Winery, which I had thought to have been closed due to being completely sold out of its wines. The Fracture demonstrated the best of what the 2008 vintage here was capable of, an essay in texture and balance with its huge, rich body of mocha and chocolate powder that dominates nuanced flavors of black cherry, black licorice and undertones of leather and tar. 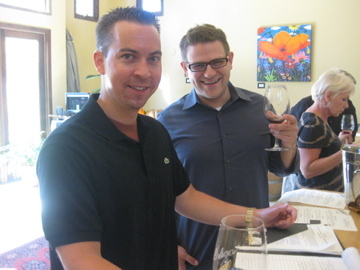 In the lively tasting room, the staff was pouring all of its new 2009 releases. The Booker Oublier 2009, (91 Points), a blend of Syrah, Mourvedre and the “forgotten” grape of Counoise that is the wine’s namesake, showed huge potential, with seamless, polished violety fruit notes that mingle with spice and soft mineral nuances. Things got even better after that with the Booker Vertigo 2009 (93 Points), a GSM blend that is ripe but complex loaded with floral dried berry, plum and black licorice above wet mineral and cedar spice that lingers long, and especially the Booker Alchemist 2009 (95 Points), a Syrah and Cabernet Sauvignon blend which is gorgeously composed with juicy blackberry and plum fruit that leads into rich, toasty mocha and leather through the massive finish. Pound for pound, this ended up being our strongest stop of the day, and the $10 tasting fee was again waived with purchase. Although you won’t find too many places in Napa Valley these days pouring juice of this quality for that kind of a fee. For lunch, we made our way up to the Farmstand 46 deli, which serves up gourmet sandwich fare along with delicious wood fire oven pizzas. I can recommend “The Goat”, a slow cooked pulled pork sandwich dressed with a dijon vinegar rather than a traditional barbeque sauce. 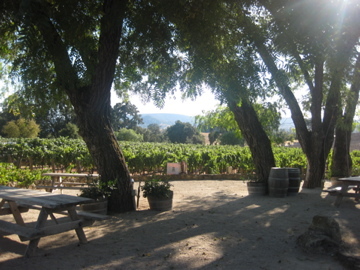 Behind the restaurant is a tasting room for Cypher Wines (formerly Four Vines, same winemaker who has sold that name). This upbeat room has a punk-rocker/ metal garage theme and pours a slough of ripe, in-your-face juice. The wines seem up to the Four Vines standard under the new label, especially the silky black currants and crème brulee flavors of the Cypher Peasant 2008 (90 Points), a GSM blend, the exotic spice and blue fruit nuances of the Cypher Anarchy 2008 (90 Points), a Zinfandel-Mourdevre-Syrah blend. Better still were the deep, luscious, ripe blackberry pie notes of the Cypher Heretic 2008 (90 Points), a Petite Sirah, and the juicy, spicy blueberry cobbler, plum pie and cinnamon flavors of the Louis Cypher Red 2008 (91 Points), a blend of 12 grapes, some very obscure. This seemed to be a very hip tasting experience. For $10, you can taste about eight wines and keep the glass. Heading up north on the sweeping, winding Vineyard Drive, we arrived at Denner Vineyards, and positioned our party at a gorgeous table in the sun overlooking the valley below. 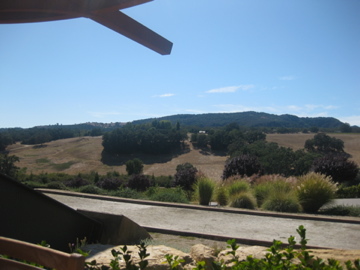 This type of setting is, to me, the ideal wine tasting experience, as our tasting host brought our pours to us in a leisurely and relaxed manner while we soaked in the views. The Denner Theresa 2010 (88 Points) tasted great in the hot afternoon sun, as this blend of Rousanne, Grenache Blanc, Marsanne and Viognier offers refreshing honeysuckle and white peach notes. However, like so many of these Paso Robles wineries, the real draw here is the red grapes. The Denner Syrah 2009 (90 Points) shows ripe, heavily perfumed wild raspberry and exotic blueberry that evolves into graphite mineral, mocha and decisive clove spice, while the Denner The Dirt Worshipper 2009 (92 Points) took it up a notch with a hint of Viognier, adding root beer, tobacco spice and smoked beef notes to the deep blackberry fruit. A real highlight of this visit was getting to spend some time talking to Ron Denner, the owner and winemaker, who wandered over to our table towards the end of our tasting. I asked him how he chose to pick this land in Paso Robles of all places back in 1997, which is now used to source fruit for big name wineries like Linne Calodo, Justin and Villa Creek in addition to his own. He couldn’t have been more modest, and essentially attributed his find to being very lucky. (For what it’s worth, we had learned the night before that scientists had done a study and proven this square mile along Vineyard Drive to rest upon the most ideal wine-growing conditions on the entire planet Earth.) He offered some amusing anecdotes, including a story about when his father explained to him what a man had to do in life to avoid becoming “A ditch digger”, a name that now graces his GSM blend, which unfortunately was not being poured. No one ever came to collect our $10 tasting fees, so we scooted off unhurried to our final stop, Justin Vineyard. Heading further up Vineyard Drive and onto Adelaida Road was probably my favorite stretch of scenery of the whole trip. I had imagined Paso Robles wine country to be flat farmland, and it is anything but, with winding, angled roads, cascading hills, and vineyards and ponds popping out of nooks and crannies underneath the cloudless blue sky. I was also surprised by the lack of traffic on these wine roads; it was almost like we had the road to ourselves, and I posted a picture below that captures how I will remember driving through this region. I had to catch my breath before we walked into the Justin tasting room, which was friendly and bustling in the late afternoon. We were able to secure a table to stand at while our server brought our wines directly to us. The highlight, as anticipated, was the Justin Isosceles 2008 (93 Points), a Bordeaux-style blend that would seem a bit out of place in this region if it didn’t explode with heavily perfumed black currants above toasty oak, green pepper earth and exotic clove and mocha spice lingering long while demonstrating finesse and elegance. Also impressive was the Justin Savant 2009 (91 Points), a blend of Syrah and Cabernet Sauvingon that shows rich polished black fruit dominated by well balanced earth notes of lead and cracked pepper. 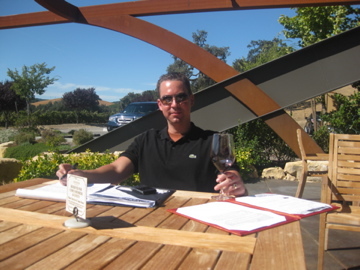 I’d tasted the Justin Justification 2009 (89 Points) and Justin Cabernet Sauvingon 2009 (88 Points) previously, and I confirmed that while they are impressive at the price range, they stand a cut below the rest of the winery’s catalog. When I accidentally spilled my glass of the former all over my shorts and my notebook, I decided it was probably time to head back to the hotel and get the car situated safely. 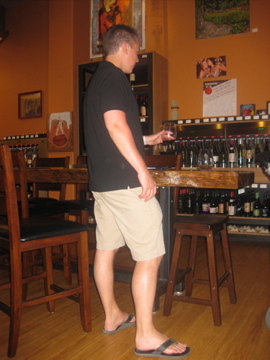 On foot again in downtown Paso Robles, I had eagerly anticipated a stop at Paso Wine Centre, which pours 48 wines by the glass and by the taste. I had picked our six or seven from their website list to taste, and walked into the spacious tasting room with my list in hand. They even had a flatscreen TV with the Florida-Alabama game on. I thought I was in heaven, but to my dismay and utter confusion, as I named off the wines on my list to the very rude, waifish and indifferent man working the dispensers, only one of the seven wines that I had wanted to taste was currently available! He was pretty unsympathetic to my disappointment, and I commented that he might want to consider keeping his website updated to avoid this sort of situation in the future. But, considering that the place was completely empty when we walked in at 5:30 pm on a Saturday night, it’s possible that this sort of service is the norm at Paso Wine Centre. Since I was there and wanted to relax for a bit, I ordered a glass of the Villa Creek Mas de Maha 2008 (91 Points), a blend of Tempranillo, Grenache, Mourvedre and Carignane that shows dark plum and cassis flavors leading into undertones of black olive, licorice and peppery spice. I ended up getting this again in my flight during dinner at Villa Creek Cafe later that night, rendering my trip to Paso Wine Centre a complete waste of time. The Paso Robles square really comes to life on a Saturday night, with live music on the outside patio at the cozy Pony Club bar and bustling, exciting restaurants like the aforementioned Villa Creek Cafe, where we dined that evening. I opted for the Pork Belly special of the day, which was truly delicious, and since we didn’t have time to visit the tasting room, I ordered a flight of Villa Creek wines (these are also available by the glass at the bar). Perhaps it was that my palate was shot by this point in the evening after a long day of tasting, but while the Mas de Maha continued to impress, the young 2009 wines failed to deliver the depth and flavor I was hoping for, instead coming off quite gripping and tannic. The best of these was the Villa Creek Avenger 2009 (90 Points), a GSM blend that had big, juicy fruit flavors of dark raspberry and blackberry above vanilla bean, mineral and sweet spice throughout its fleshy texture. Our final winery stop on our last day was a private tasting at Linne Calodo Vineyard, who has just recently bottled its 2009 wines and were able to offer us a slot at their gorgeous facility. 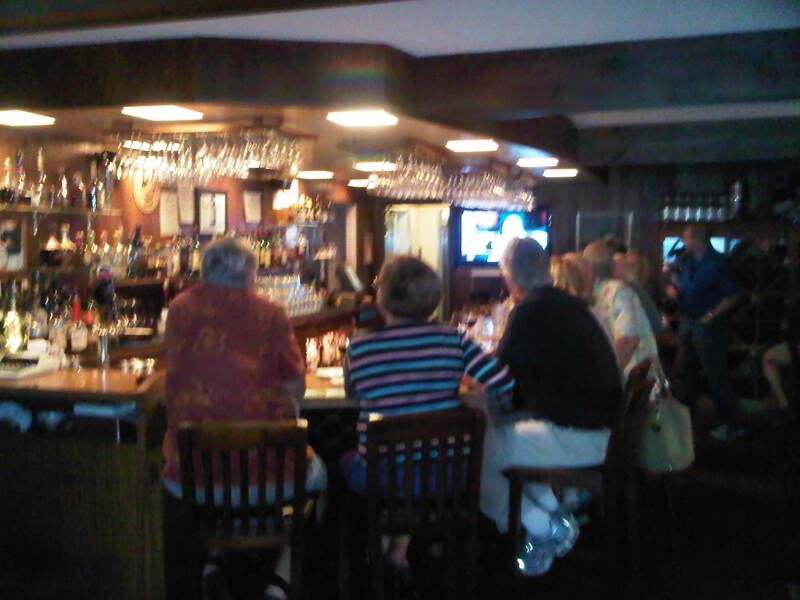 When we arrived, Maureen Trevisan, owner and wife of winemaker Matt Trevisan was there to welcome us at the bar and had prepared personalized tasting menus for us. We started with an unlabeled 2010 blend of white grapes before moving onto the two reds, which alone were worth the trip to the winery. The Linne Calodo Slacker 2009 (92 Points) is a GSM blend that defines elegance, showing perfumey boysenberry and wild blueberry fruit above wet stone mineral and exotic spice notes. The juicier, riper Linne Calodo The Outsider 2009 (92 Points) coats the palate with smooth, ripe blue fruit notes that lead into white pepper and chalky mineral. This gains depth and richness from blending Zinfandel in place of Grenache. After we tasted these wines, Maureen led us out to see the equipment and the barrel room. All of the processes and equipment used at the winery are very state-of-the-art and efficient, and we were both blown away by how clean and organized the facility was. The barrel room was so immaculate that you could practically eat off of the floor, and I have to imagine that producing the wine in this manner has a huge influence on its ultimate quality. There were some Zinfandel grapes that had been picked two weeks prior fermenting in a tank, and I got to taste the wine in the middle of the process. While not high in alcohol at this early stage, the wine showed huge juicy dark fruit notes and an impressive richness. I was told that some of these grapes will be used to blend the 2011 Problem Child, the 2006 and 2007 vintages of which are the winery’s highest scoring Wine Spectator wines in its history. Back inside, we were offered a retaste of any of the wines from our original tasting. I opted to retaste the Slacker, and promptly bought a bottle to bring to our dinner at Artisan that night. Somewhat surprisingly, we were still assessed a tasting fee of $15 per person, which combined with the bottle purchase made this a fairly expensive stop. However, we felt that we enjoyed a unique experience here, and I now have a better grasp on how the Linne Calodo wines have gained such a cult following. Later that night at Artisan, we enjoyed of lovely dinner with our bottle of Slacker, complete with an appetizer of gouda and Anchor porter fondue served with andouille, broccoli and garlic bread that Maureen had recommended. For dinner, pork tenderloin with pig cheeks and sweet potatoes as well as hanger steak with braised lobster mushrooms and bbq beans hit the spot and ended our trip in supreme culinary style. As an added bonus, I caught a glimpse of Ron Denner eating at the bar, and enjoyed a lengthy conversation with the winemaker we had met the day before as well as his fiancee on their way out. As an aside, I’d be remiss not to mention a lovely tasting experience I had with the folks at Cass Winery back in September at the Windy City Wine Festival. Their winery in Paso Robles is east of downtown and a bit off of the beaten path, and since our efforts were concentrated to the west and around the Highway 46 area, we didn’t have time to drop in for a visit. I spent some time talking with owner Doug Cass and his wife, and they showed great hospitality as I tasted through their wines, the most impressive of which was the incredibly polished Cass Syrah 2008 (93 Points), which showcased an incredible texture of earthy leather, black pepper spice and smoke poised above well-balanced black currant fruit notes. 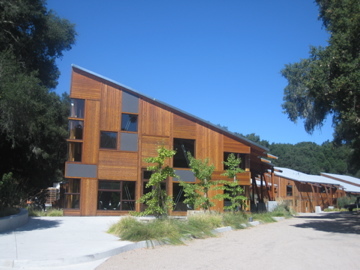 Another winery that we drove right past but ran out of time for is Tablas Creek, located on Vineyard Drive just south of Justin. Luckily, I had the chance to get my hands on a bottle of their very fairly priced Tablas Creek Cotes de Tablas 2009 (92 Pounts), a GSM blend that is soft and light on the palate with its effortless mingling of wild berry, plum and cherry fruit above white pepper and cinnamon spices. BOOKER FRACTURE PASO ROBLES 2008, 96 POINTS, $50- Elegant aromas of black cherry, chocolate and perfumey blackberry. Huge, rich mouthfeel with mocha and chocolate powder that dominate blackberry, black cherry and black licorice fruit above earthy undertones of leather, tar, crushed rock and peppery spice, all underneath an impossibly svelte and silky texture for such a rich, powerful wine. Finish lasts for minutes. JAFFURS SYRAH VERNA’S VINEYARD SANTA BARBARA COUNTY 2008, 94 POINTS, $45- Pours dark as night, with complex aromas of perfumed blackberry, mocha bean, cracked pepper and leather. Impressively seamless on the palate for its massive depth, with black plum, blackberry and licorice flavors carrying into layers of earthy leather, tar and black pepper spice. The finish lingers long with a creamy mocha note and elegant spices, with pepper lingering longest of all. This is my type of Syrah. The slightest hint of dryness lingers but this will be amazing with time. ZACA MESA SYRAH RESERVE SANTA YNEZ VALLEY 2007, 93 POINTS, $42- Gorgeous nose of black cherry above smoke and mocha nuances. Elegant and juicy with its black currant and cherry notes, leading into smokey bacon, leather, mocha bean and pepper and herbal spice. Very polished and elegant mouthfeel, yet very deep and complex throughout. Finishes with a touch of wet stone mineral as the fruit keeps pumping with firm tannins. CASS SYRAH PASO ROBLES 2008, 93 POINTS, $42- Lovely aromas of blackberry fruit, perfume, oak and orange peel. Incredible texture, with leather and black pepper spice above well-balanced black currant fruits. Soft body and texture, with peppery spice and smoke notes lingering long with silky, dissipated tannins. TENSLEY SYRAH COLSON CANYON VINEYARD SANTA BARBARA COUNTY 2010, 92 POINTS, $38- Complex nose of leather, smoked meat, black pepper, dark plum and floral violet. Lively and spicy on the palate, with roasted meat and smoke notes leading into blackberry and dark plum fruit that is enveloped by a streak of black pepper and floral spices. Showing quite well for its youth, with a finish that lasts for minutes. CALIZA SYRAH PASO ROBLES 2008, 92 POINTS, $45- Ripe and spicy on the nose, with black cherry, plum and cracked pepper aromas. Polished and silky on the palate, with juicy plum, cherry and licorice notes that evolve into smoke, mocha and peppery spice adding depth through the long finish. Very structured and elegant, delivering a mouth full of fruit and an exotic spice note that carry with impressive length through the finish. DENNER THE DIRT WORSHIPPER PASO ROBLES 2009, 92 POINTS, $45- Deep and intense on the nose, with charred black cherry and tobacco leaf above hints of smokey beef. Very deep and pure, with blackberry, root beer and smoke notes through a delicate, silky texture. Dryness creeps in late but this lingers long with tobacco and white pepper spice notes. 95% Syrah, 5% Viognier. JAFFURS SYRAH SANTA BARBARA COUNTY 2009, 90 POINTS, $25- Burly aromas of well-water mineral, leather and tar above red currant fruits. Rich, deep and heavily perfumed on the palate, with blackberry and dark plum fruit leading into cocoa powder, exotic spices, cracked black pepper and earthy leather through a long, balanced finish. A big wine, with firm tannins adding dryness. TENSLEY SYRAH SANTA BARBARA COUNTY 2010, 90 POINTS, $25- Dark raspberry, blueberry and a hint of earthy leather on the nose. Soft on the palate, with surprisingly bright red currants and wild berry fruits that evolve into undertones of chocolate, smoked beef, black pepper and graphite mineral. Ripe, but complex, with firm tannins adding grip. CARINA SYRAH SEVEN PERCENT 2007, 90 POINTS, $36- Ripe and raisiny on the nose, with dark plum, fig and pomegranate notes. Very dark and rich, but smooth, with licorice, plum and blackberry fruit above smoked beef, black pepper and chocolate. Very dry through the finish, but rich fruit lingers. DENNER SYRAH PASO ROBLES 2009, 90 POINTS, $40- Aromas of wild berry, violet and clove spice. Ripe and heavily perfumed, with wild raspberry and exotic blueberry fruit that evolves into graphite mineral, mocha and decisive clove spice elements. Medium length, but this is exotic. ZACA MESA SYRAH SANTA YNEZ VALLEY 2008, 89 POINTS, $25- Black plum, dark raspberry and vanilla bean on the nose. Juicy and ripe with its plum and dark berry fruit notes, leading into layers of exotic lavender spcie, chocolate and soft minerality. Medium length, with silky tannins adding grip. BOOKER ALCHEMIST PASO ROBLES 2009, 95 POINTS, $60- Huge, massive nose of cassis, mocha, smoke and leathery earth. Perfectly silky smooth on the palate, with loads of juicy blackberry and plum fruit that leads into toasty mocha and espresso undertones that linger with peppery spice and leather notes. Impossibly smooth and rich, with silky tannins adding structure through the long, complex finish. 65% Syrah, 10% Cabernet Sauvignon, 10% Petit Verdot, 10% Tempranillo, 5% Grenache. BOOKER VERTIGO PASO ROBLES 2009, 93 POINTS, $60- Very ripe and purple fruit on the nose. Perfumey body of dried berries, flowers, black licorice and plum above black pepper spice and a wet mineral, cedary undertone. This is so complex, but the beauty lies in the texture. Long, long finish, with spice and perfumed fruit carrying. 48% Grenache, 35% Syrah, 17% Mourvedre. JUSTIN ISOSCELES PASO ROBLES 2008, 93 POINTS, $62- Incredibly inviting nose, with perfumey black fruits and cocoa powder aromas. Creamy body layered with blackberry perfume, black cherry and violet above toasty oak, vanilla bean and the slightest hint of green pepper earth. Complex and layered with earthy clove and mocha spices lingering through the long, balanced finish. 78% Cabernet Sauvignon, 13% Cabernet Franc, 8% Merlot, 1% Petit Verdot. TABLAS CREEK COTES DE TABLAS PASO ROBLES 2009, $30- Red cherry, orange peel and rose petal on the nose. Ripe, soft red fruits are creamy in texture, dominated by exotic cherry, red plum and wild berry and an element of white pepper spice thorugh the long finish. 43% Grenache, 24% Syrah, 18% Counoise, 15% Mourvedre. LINNE CALODO SLACKER PASO ROBLES 2009, 92 POINTS, $48- Juicy berry notes, violet perfume and allspice aromas. Seamless, light texture, with perfumey and juicy wild berry and boysenberry above a delicious blue fruit streak, wet stone mineral and exotic spice notes. Long finish, with impressive balance and structure for it youth. Grenache, Syrah and Mourvedre. LINNE CALODO THE OUTSIDER PASO ROBLES 2009, 92 POINTS, $55- Bright, spicy berry fruit notes with aromas of lavender perfume. Exotic and perfumey with blueberry and plum notes that are ripe, juicy, smooth and silky, leading into white pepper spice and chalky mineral that linger long with the fruit through a perfect texture. Syrah, Mourvedre and Zinfandel. CARINA CLAIRVOYANT CENTRAL COAST 2008, 91 POINTS, $28- Perfumey aromas of wild berry, cranberry and raspberry. Balanced and even, with juicy flavors of bacon-wrapped dates, blackberry and black plum, above peppery spice. Big and rich, but not overripe, and impressive for its balance between dark fruit and earth. Long finish. 55% Syrah, 30% Grenache, 15% Mourvedre. VILLA CREEK MAS DE MAHA PASO ROBLES 2008, 91 POINTS, $35- Lots of dark plum and exotic spice notes on the nose. Juicy and ripe with dark plum, black cherry and cassis notes that lead into earthy leather and black pepper spice. Very concentrated fruit here, turning earthy and dry on the finish with notes of black olive and licorice. Finish lingers long, with a firm tannic grip. Needs time. 60% Tempranillo, 20% Grenache, 10% Carignane, 10% Mourvedre. CYPHER LOUIS CYPHER RED PASO ROBLES 2008, 91 POINTS, $40- Rich and ripe, with cherry pie and blueberry aromas. Juicy and spicy, with plum pie and blueberry cobbler notes above cinnamon spice, caramel and toffee notes. Very rich but well-textured, with a blast of cinnamon spice lingering through the long finish. Carignane, Petit Verdot, Petit Sirah, Zinfandel, Teroldego, Touriga Nacional, Tinta Coa, Sousou, Tinta Ruiz Blend. ZACA MESA Z THREE SANTA YNEZ 2007, 91 POINTS, $42- Deep, perfumey blackberry aromas with a hint of chocolate and a touch of smoked bacon fat. Elegant body with complex leathery earth and cracked black pepper above juicy blackberry and black plum that turns smokey through the long finish. Velvety tannins hold it all together. 49% Syrah, 31% Mourvedre, 20% Grenache. JUSTIN SAVANT PASO ROBLES 2009, 91 POINTS, $45- Big, ripe aromas of blackberry, black cherry, leather and cracked pepper. Polished, with a leathery note and earthy lead and black pepper above its dark plum and blackberry fruit. Rich and full of flavors, balance with its impressive earthy aspects. Cracked pepper and lead notes linger with silky tannins adding depth. 68% Syrah, 32% Cabernet Sauvignon. BOOKER OUBLIE PASO ROBLES 2009, 91 POINTS, $60- Perfumey nose of blueberry pie, plum and spice. Silky and seamless on the palate with juicy blackberry, blueberry and plum notes above violety spice that evolves into undertones of soft mineral through the long, polished finish. 34% Grenache, 33% Mourvedre, 33% Counoise. BYRON PINOT NOIR NIELSON VINEYARD SANTA MARIA VALLEY 2009, 91 POINTS, $36- Elegant, perfumey nose of dark plum, blueberry and smoke. Incredible mouthfeel with juicy plum, blueberry and black cherry fruit along with violet and floral spice that leads into complex smoke and clovey spice through the long finish. Tons of fruit, balanced impeccably. FOXEN PINOT NOIR JOHN SEBASTIANO VINEYARD SANTA RITA HILLS 2009, 91 POINTS, $46- Very smokey on the nose, with oak and plum fruit nuances. An exciting Pinot, with perfumey violet and notes of plum and blueberry combining with a decisive campfire smoke note and exotic cooking spices. Purple, but not overripe, lingering long with its allspice notes. BYRON PINOT NOIR SANTA MARIA VALLEY 2009, 90 POINTS, $26- Black cherry and dark raspberry aromas, with a hint of cinnamon spice. Elegant and spicy, with cherry, plum and wild raspberry flavors that lead into a finish of toasty oak. Complex array of cinnamon, cardamom and nutmeg spice, with impressively perfumed fruits. Long finish. FOXEN PINOT NOIR SANTA MARIA VALLEY 2009, 89 POINTS, $34- Very ripe fruit and floral aromas with just a hint of mushroomy earth. Smooth, elegant body with raspberry jolly rancher, watermelong and red cherry notes above undertones of rose water and white pepper spice. Polished and well balanced through the long finish. JAFFURS PINOT NOIR MISTRESS SANTA BARBARA COUNTY 2009, 89 POINTS, $40- Ripe raspberry and cherry aromas, with earthy mushroom and tobacco leaf along with a floral rose note. Elegant and perfumey body of extremely ripe dried berry and cherry fruit, hints of red licorice but not tart. Subtle mineral and tobacco spice lingers with a medium length and a lively acidity that keeps the fruit pumping. BYRON PINOT NOIR JULIA’S VINEYARD SANTA MARIA VALLEY 2007, 89 POINTS, $40- Funky nose of mushroom earth and barnyard above understated wild berry and strawberry fruit. The palate seems more fruit forward and ripe, with red cherry, pomegranate and rose water that lead into earthy notes through the long finish. Soft tannins and white pepper spice add intrigue. TENSLEY CHARDONNAY LEA SANTA RITA HILLS 2010, 89 POINTS, $32- Fresh citrus aromas of lemon and grapefruit. Impressive balance, this is rich without being oaky, with bright citrus flavors shining. Very clean, with fresh acidity and just a touch of minerality and spice. Long finish. BYRON CHARDONNAY SANTA MARIA VALLEY 2008, 88 POINTS, $26- Buttery oak aromas, with golden apple citrus and a hint of brown sugar. Creamy body of rich lemon, pear and apple citrus above smooth honey and vanilla bean notes. Some exotic spice kicks into through the long finish. JAFFURS VIOGNIER SANTA BARBARA COUNTY 2009, 88 POINTS, $27- Extremely inviting floral bouquet with apricot notes. Creamy with concentrated fruit notes of peach, apricot, lemon and floral spices. Rich and focused, with a soft minerally finish. ZACA MESA Z BLANC SANTA YNEZ 2009, 88 POINTS, $28- Very floral, with honey and pear aromas. Creamy and loaded with floral spices, citrusy apricot and pear notes, balanced impressively with subtle oak and honey nuances that add depth and texture through the long finish. 69% Grenache Blanc, 31% Roussanne. TENSLEY CAMP 4 VINEYARD BLANC 2010, 88 POINTS, $28- Intense floral aromas with tropical honey dew melon and pineapple. Crisp and refreshing, with candy sugar above tropical citrus and spice notes. Creamy texture and a long finish, with toasty spice lingering. Great balance. 65% Grenache Blanc, 35% Roussanne. DENNER THERESA PASO ROBLES 2010, 88 POINTS, $30- Very floral, with white peach and honeysucke aromas. Crisp, clean and refreshing, with a creamy honey note that permeates floral citrus and white pepper spice. Medium length. 40% Roussanne, 30% Grenache Blanc, 20% Marsanne, 10% Viognier. There really isn’t a weak moment anywhere here nor does the album waver with its overall style, and the only time the mood seems to shift suddenly, it does so with dramatic and meaningful effect. Centerpiece “Dirge/M” is nine minutes of completely repetitive acoustic guitar and electronic piano instrumentation that builds so subtly with its nuanced undertones- there’s elements of an electronic horn, a fluttering guitar noise, and a soaring, whispy bit of lifted distortion that beckons Godspeed You Black Emperor- that express the aftermath of a relationship that has died. Beginning with an industrial grind and heavy percussion, this evolves into a call-to-arms masterpiece, with electric guitar swirling beneath massive, epileptic drum track change ups. This is the sort of song I imagine playing in my head before going into the deciding battle of a war, or before making a life or death decision, or some kind of a monumental, life-changing and ultimately serious event. In its final half, the considerable intensity surrenders into distorted shoegaze and eerie choral and violin notes that leave some uncertainty as to the outcome of the battle. And more relevantly and poignantly, what exactly was the battle for in the first place? Perhaps only Bear Like Mouse himself knows for sure, but I’ll happily keep listening to Fugue to figure it out for myself, even if I never do.